In my last post I touched on the fact that when my inner circle has an opening, I will start trying to fill it. Both consciously and unconsciously. It doesn’t always happen immediately, it does depend on the fallout. 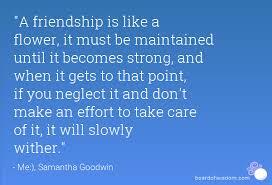 If a friendship fades out slowly and naturally, then the replacement process usually happens at a slower more natural pace too. However, if the friendship fall out was sudden and or painful, the loss seems to be felt at a much deeper level. Agree or disagree as you will, but my comfort number is 5. I feel like all my social needs of giving and usually receiving are at capacity at 5 inner circle friends. So if one suddenly combusts, I definitely start to feel a bit lonely. This seems perfectly reasonable and understandable, doesn’t it. They say that the first step is acknowledging the problem, and if I can identify that I am lonely, the solution seems obvious! Start making more effort to grow existing outer circle friendships and acquaintances, or reach out and start looking for new friends! Why not hedge your bets and do both? I often do! So what’s the problem? Don't get blinded by all the pretty colours too quickly. See what lasts! This causes friendship drama down the road when you want to reduce the intensity, cool the friendship, or essentially realise that you don’t have much in common with that person and probably have never been all that compatible. This realization may come when the rose coloured glasses naturally fade, or when, over a period of time, you meet more of the types of people you really feel you “fit” with and gravitate towards them and away from the other person. Not only is it bad for you, it’s not particularly kind to the other party either. Of course, people change and grow. Maybe they changed or you did and you weren’t always as incompatible as you seem now. The problem isn’t them, nor is it you, but the circumstances under which you met perhaps? So what can we do to avoid this problem? Firstly, acknowledge that you miss your ex friend. Sometimes we confuse that with loneliness. Even if you were the one who ended it, you probably (I hope!) did like your friend and miss things about her and your friendship how it was BEFORE things started to decline between you. Secondly, allow yourself to grieve and miss your friend. She cannot be replaced, she was one in a million and no friendship will be quite like hers. Thirdly, focus on yourself. Make goals. Work goals, health and fitness goals, and recreational goals. Spend a period of time sitting with your emotions and just focusing on these goals, I promise by the end of it you wont notice that urgent feeling so much. Enjoying your alone time is essential for mental health, as are those social needs. Don’t use one to avoid the other in any variation, but be comfortable with both, and they will find a balance that works for you. Once you feel comfortable and better about yourself because you achieved some goals and no longer fear being alone, you are in optimum condition to begin reaching out. Remember you are looking for friendships, not particular people or traits. Be open and see who you meet. You’ll know when you feel chemistry with someone, even platonically, however you will be aware enough to know that a slow burn is better in the long term. Spend time. Slowly get to know people and see who naturally falls into that inner circle, while still nurturing the others who reside there. Acting on loneliness actually almost always leads to this exact phenomenon ironically enough! It's a nasty cycle. Break the habit! Remember that the inner circle is always interchangeable and that is normal. Friendships ebb and flow in closeness for a whole range of reasons, and there is nothing WRONG with you! The worst thing you could do is assume that you must be flawed and inadequate in some way. Just keep being you and keep that confidence up regardless of other people, and the right sorts will be drawn to you. Just because someone has a place in your inner circle doesn’t mean you are entitled to a place in theirs. Similarly, just because someone has been a member “forever” (ForNever even!) doesn’t mean their time there is guaranteed, nor is your time with anyone else. Enjoy the people in your inner circle for as long as you have them there, and allow themselves, and yourself the freedom to change who resides there from time to time. Keep an open mind, be open to new people, even when you are at capacity, and take a good look at those friends who are in the outer circle. Are you in their inner circle? Is there some reason they didn’t make it to yours? Have you simply overlooked someone, or have they just not blossomed naturally yet. 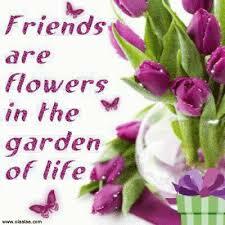 Water the friendship some more and see what blooms. Is loneliness your friend? No, but it also isn't your enemy. You don't desperately need to escape it. Just let it visit and naturally pass. Desperation is off putting to healthy people anyway, so you wont attract the right sorts typically under those conditions. We all feel it occassionally, just don't let it be a permanent state! Remember that the social need in humans is real, but the more urgent it feels, the less genuine and rewarding the fruits will be. Take your time. Be patient. Have faith. Enjoy the sunshine while you wait, and water your own inner seed. I should take my own advice, and I will! Newer PostForget the ending, not the friending! Older PostThe friendship life cycle - circle of 5!